Fat intake was then broken down to SFA, MUFA and PUFA. 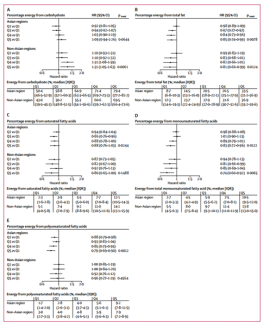 Intake of all three classes of fats was inversely associated with total mortality (Q5 vs Q1: RR = 0.86, 0.81, 0.80). 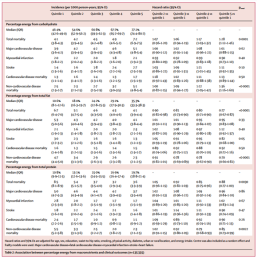 which in all cases was due to an reduced risk of non-CVD mortality (Q5 vs Q1: RR = 0.86, 0.79, 0.75). 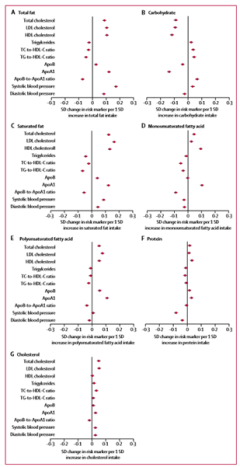 * SFA was the only class of fatty acids to be inversely associated with stroke mortality. This isn’t the first hint that such a relationship may exist, as the Siri-Tarino meta-analysis also found an inverse relationship between SFA intake and stroke (events not deaths) but one that didn’t reach significance (RR = 0.81, CI = 0.62-1.05, P = 0.11). 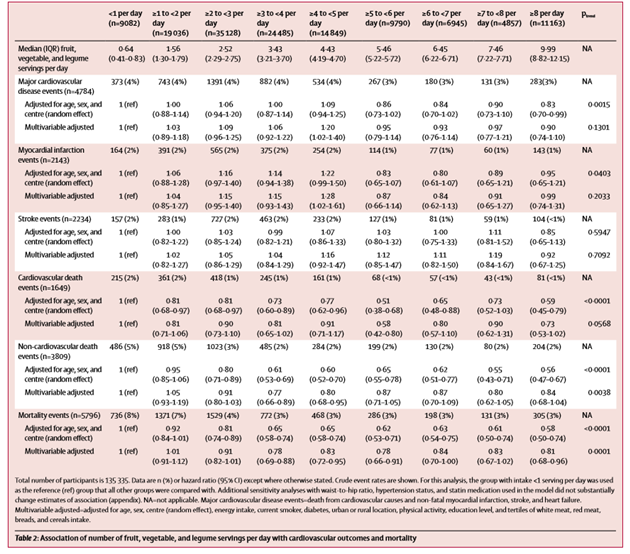 This may be a bit of surprise, particularly to diet heart true believers, but then the lipid and diet heart hypotheses were always based on coronary heart disease, not stroke or other manifestations of CVD. I initially found the fat versus carbohydrate debate that this study reignited to be quite old. 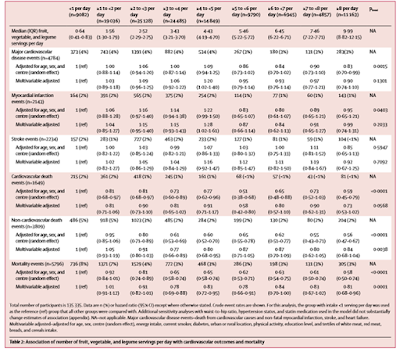 Despite the popular version of the Mediterranean diet and the standard western diet having very similar fat and carbohydrate intakes, it’s clear that they have very divergent health effects. 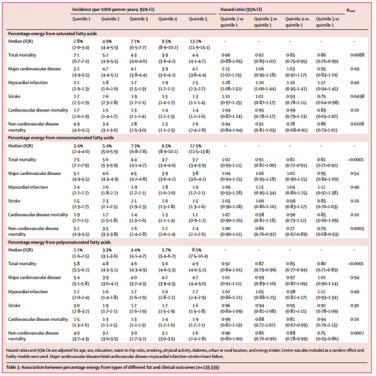 This difference in health outcomes is far more likely due to differences in diet quality rather than a few percentage points difference in fat and carbohydrate intake. It can be easy to live in a bubble where this knowledge is taken for granted. But this bubble bursts on occasion and then it becomes apparent that many in the general population (including nutrition students!!!) place a large emphasis on reducing fat intake, believing fat increase the risk of weight gain and chronic disease, even though the such beliefs should be at least a decade or two out of date. The weird associations between fats and MI can possibly be explained by the inability to measure trans fats. Trans fats impair DHA metabolism which influences clotting and inflammation, and seem to have no effect or even a beneficial effect on purely metabolic diseases like diabetes or obesity, so MI is exactly where we'd expect to see them. Trans fats in PHVO and shortening are made by the conversion of PUFA to trans MUFA and SFA respectively. So any of these three fat types depending on the food could be most strongly correlated with the missing TFA. 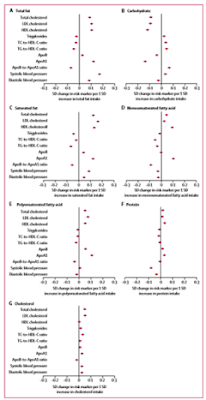 Of course PUFA may be associated with MI because it's sourced from cheap or overheated oils rather than nuts or other foods (there's a note in PURE that the study gives no evidence about oils, as distinct from other food sources of PUFA). Why wasn't trans fat measured? I'm not sure, but maybe because PHVO was being removed from the food supply in some countries, notably India and Canada, during the study period. As for that respiratory mortality effect in NHS/HPFS, the news from NHS2 is that disinfectant use is associated with COPD (OR around 1.25). This wasn't known about or controlled for in NHS/HPFS. 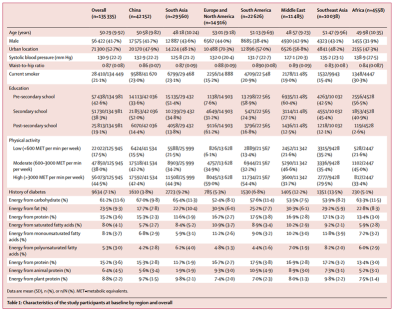 Airborne pollutant exposure other than smoking never is, but people in Western populations who work with or live near pollutants are those most reliant on meat and eating more saturated fat. You can bet the vegan and vegetarian are not going to apply for the job in the oil refinery or tyre plant. Similarly the nurses working with bleach most will be tend to be the underpaid blue collar individuals cleaning up in rest homes, not the lucky ones working in upscale surgeries. And, of course, a hidden TFA content of MUFA and PUFA would also explain the correlation with LDL - without that necessarily being the link to MIs. Thanks for the comment George, that makes some sense. Are you saying that artificial TFA (e.g. elaidic acid) may have a beneficial effect on metabolic health, or just ruminant TFA (vaccenic acid and CLA) which seem to have some strong inverse associations with type 2 diabetes? but not diabetes (less evidence but probably a small non-significant association). So I think that ruminant TFA (CLA is actually a cis, trans fat so TFA is a misnomer in that case) is beneficial - in its dietary context, not necessarily as a supplement. Elaidic acid and (perhaps more so) the whole raft of rarer, novel TFAs formed in PHVO etc are bad for the heart, maybe through their effects on DHA and clotting. But attempts to say TFA (or at least elaidic acid) is behind cancer, obesity, diabetes etc have less evidence - the food it's in, probably, but a distinct metabolic difference between elaidic acid and other fats is less obvious. Thinking about disinfectant and COPD, it could damage the lungs directly, especially bleach; there could well be a hygiene hypothesis interaction with the lung microbiome - but the more prosaic explanation would be that the nurses who need to use bleach most often are exposed to the most virulent airborne pathogens, are dealing with the sickest people and greatest discharge of infectious fluids.